What Are the Basics of a Franchise? Many types of franchises exist today, in an ever-growing range of industries. It's estimated that over 120 different industries use franchising. Restaurants and food offerings still make up the largest part, but today franchises have even developed in the home healthcare and medical services markets. From a legal perspective, a franchise basically consists of a defined type of license granted by one business owner to another. At its core, though, franchising is really about the relationship the franchisor has with its franchisees. The franchisor licenses its trade name and its operating methods, meaning its system of doing business, to a franchisee, and the franchisee agrees, as their part of the deal, to do business according to the terms of the license. The franchisor provides the franchisee with many forms of business support, while also exercising control over some elements of the franchisee's operations as needed, to protect its intellectual property and ensure that the franchisee adheres to its brand guidelines. In exchange for the use of the intellectual property and the provision of business support, the franchisee usually pays the franchisor a one-time initial franchise fee and a continuing royalty fee, covering the use of the franchisor’s trade name and operating methods. The franchisor takes little to no role in the day-to-day management of the franchisee’s business because the franchisee is an independent operator, not a joint employer with the franchisor. For this reason, while the franchisor may provide guidance on human resources best practices, for example, the franchisee is free to hire, compensate, schedule, set employment standards and practices, and discipline their staff without any input from the franchisor. While features like uniforms and food preparation processes are part of the system's brand standards, the rate of pay or the hours scheduled fall under control of the franchisee. Franchising is a methodical system for expanding a business and distributing goods and services through multiple outlets. It works based on the relationship between the brand owner and the local operator, teaming together to skillfully and successfully expand. It's a contractual relationship and while both the franchisor and franchisees share a common brand, each is in a different business in a legal and practical sense. The franchisor works to add additional franchises and support its existing franchisees, while each franchisee agrees to manage and operate their business to the terms of the agreements. The franchisor exercises control or provides assistance to the franchisee. It's important to not rely strictly on the federal franchise definition. The definition of a franchise varies significantly under the laws in various states and may include other definitional elements including, but not limited to, the franchisor providing a marketing plan or maintaining a community of interest with the franchisee. As a business owner, you might question whether it makes sense for you to franchise your business. Experienced and competent franchise lawyers or consultants can help you analyze your business needs and determine whether franchising fits. Because care is not always taken in selecting the right lawyers or consultants, some businesses have either not needed to franchise to expand, or expanded without meeting the requirements of the franchise laws. Both are costly and unnecessary mistakes to make. Under a Business Format Franchise, the type of franchising most familiar to the average person, the franchise relationship generally includes the entire business format and not simply the franchisor’s trade name, products, and services. The franchisor generally provides operating manuals, training, brand standards, quality control, a marketing strategy, site location assistance, and more. For instance, McDonald’s doesn’t franchise hamburgers, and Jiffy Lube doesn’t franchise oil changes. Both companies license their intellectual property, which includes their trademarks and business systems. As you might notice from the history of both brands, their products and services have dramatically changed over the years, and the structure of a business format franchise allows them to accomplish this easily. A franchisor’s brand is its most valuable asset. Customers decide which business to shop at and how often to frequent that business based on what they know, or like, about the brand. Consumers don’t concern themselves with who owns the assets of the business. They just want to obtain the products and services for which the brand is known. Franchising allows “formula entrepreneurs” to own and operate a business under identified brands. When working with a good franchisor, franchisees receive the tools and support they need to live up to system standards and ensure customer satisfaction. Franchisors expect consistent execution of the company's brand standards at each location, regardless of whether the location is company-owned or franchisee-owned. 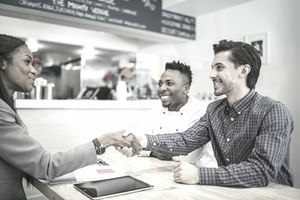 Franchisors invest a lot of time, energy, and financial resources in developing and supporting their brands, and in the consumer's mind, a franchisor's brand equals the company's reputation. Successful franchisors enforce system standards with franchisees, because they want to ensure that customers are satisfied each and every time they shop at a franchised location. The franchisor also needs to protect the equity of the brand, as well as other franchisees sharing the brand. Franchisors provide not only the menu of established products and services but also an operational system and brand that have already proven themselves. In successful franchise systems, the franchisor and franchisee work together for mutual benefit.